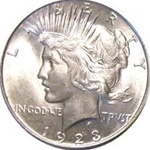 Peace Silver Dollars were minted from 1921-1935. This unique coin was designed by Anthony de Francisci to depict a feeling of peace and were minted for a total of nine years. 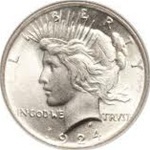 It is the last United States dollar coin that was made from silver. If you are wondering where to get a Peace Silver Dollar coin, U.S. State Quarters is here to help. Our collection of Silver Peace Dollars for sale online includes grades ranging from good to brilliant uncirculated. We use strict Photograde standards on all of our coins. When you buy Peace Silver Dollars online through U.S. State Quarters, you will receive low prices and a low shipping rate anywhere in the United States. Go ahead and explore our selection to find the perfect Peace coin for your collection.